The folks at Niwango have announced a beta trial for users to setup a live broadcast channel from and for their mobile handsets. According to the announcement [.PDF in Japanese] they will enable up to 500 concurrent viewers starting June 1st, with plans to scale up to support a total of 3,000 viewers per stream in July. They have positioned this as an experimantal service and for the initial launch it will only be available to premium members who also subscribe via i-mode. If you don’t know what NicoNico Douga (Smile Video) is, they presented to Mobile Monday Tokyo in July 2008 – details Here. Users can upload, view and share video clips. Unlike other video sharing sites, however, comments are overlaid directly onto the video, synced to a specific playback time. This allows comments to respond directly to events occurring in the video, in sync with the viewer – creating a sense of a shared watching experience. Nico Nico Douga’s atmosphere is close to 2channel’s or Futaba Channel’s, and many popular videos have otaku tastes, such as anime, computer game and pop music. 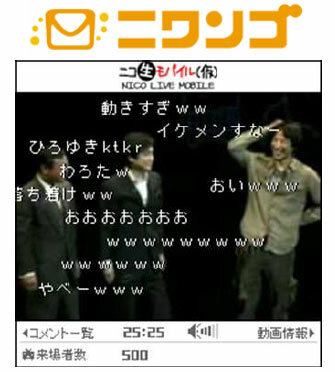 Nico Nico Douga offers tagging of videos. Tags may be edited by any user, not just the uploader. Each video may have up to ten tags, of which up to five may be optionally locked by the uploader, but all others may be edited by any user. Frequently these tags are used not only as categorization, but also as critical commentary, satire, or other humor related to the video’s content. The site is also known for its medleys of popular songs on the website, most notably Kumikyoku Nico Nico Douga. previous post: MCN Powers Smart Search :: next post: The Worlds Largest Cell Phone Strap!